It's been almost two years since Hurricane Ike slammed into Galveston, Texas, and pert near wiped it off the face of the planet. But I'm here to tell you it's a hopping and happening place in 2010, and there's no better place to spend Spring Break. The drive to Galveston wasn't so bad (about six hours), cruised up and down Seawall Boulevard (was getting a bit dark so didn't see any "saucy wenches"), ate some fried fish and shrimp at Benno's. 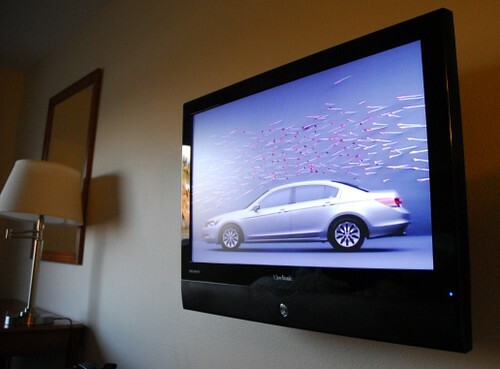 But what is going to make this trip even better is what is in my hotel room -- a 32-inch, High Definition Multimedia Interface Flatscreen ViewSonic Television, with Dolby Digital Sound, hanging from the wall. Oh baby, now THAT is living the high life! More than 100 channels. Did you hear what I just said? One Hundred! And I flipped through each one. How many stations do I get at home? Zero! But on Spring Break, in Galveston, I have more than 100 to choose from -- 111 to be exact. So, What Would Jack Sparrow Do? Order a bottle of rum and watch every single last blessed one of those channels. Even the ones in Spanish. Oh, baby! This is going to be a Spring Break to remember!